K.L. 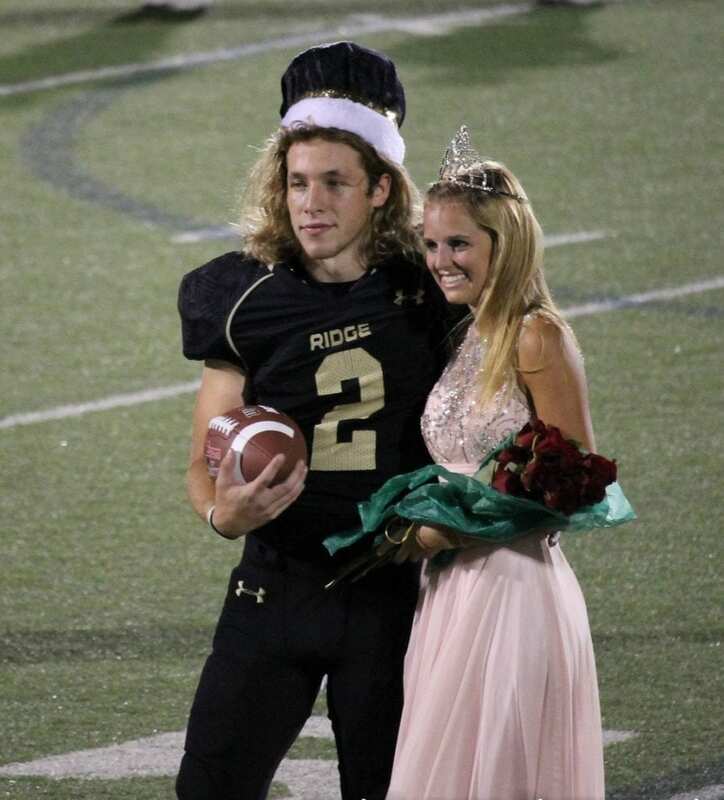 Norwood was on the sidelines at homecoming, not expecting to be crowned king, something he craved. He was unable to play football, and his best friend Max Akin was the star quarterback. Max was also slated to win the title of homecoming king. But then the quarterback did the unthinkable, changing K.L.’s life forever. It was halftime on a typical Texas Friday night, and Fossil Ridge High School quarterback Max Akin was already having a big night under the lights. The senior signal-caller had thrown for 200 passing yards, rushed for 60 more and accounted for four touchdowns. But despite all that, Akin still hadn’t made what proved not just the biggest play of his career, but of his young life. 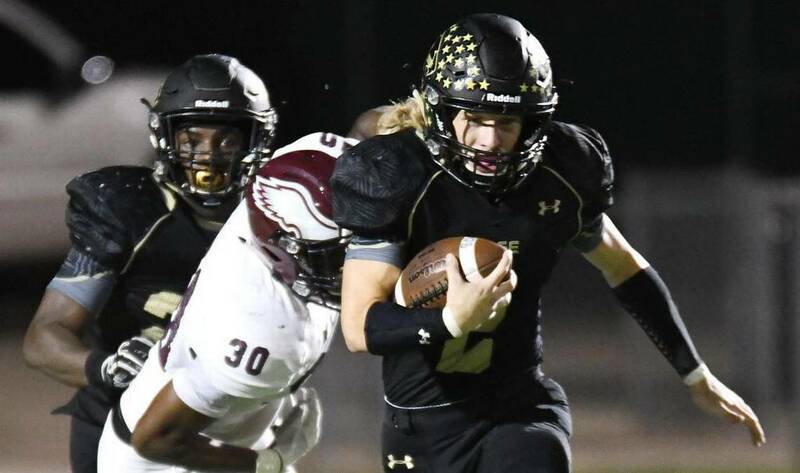 Max Akin began his football career as a wide receiver for Fossil Ridge, but his natural arm talent couldn’t be suppressed forever. 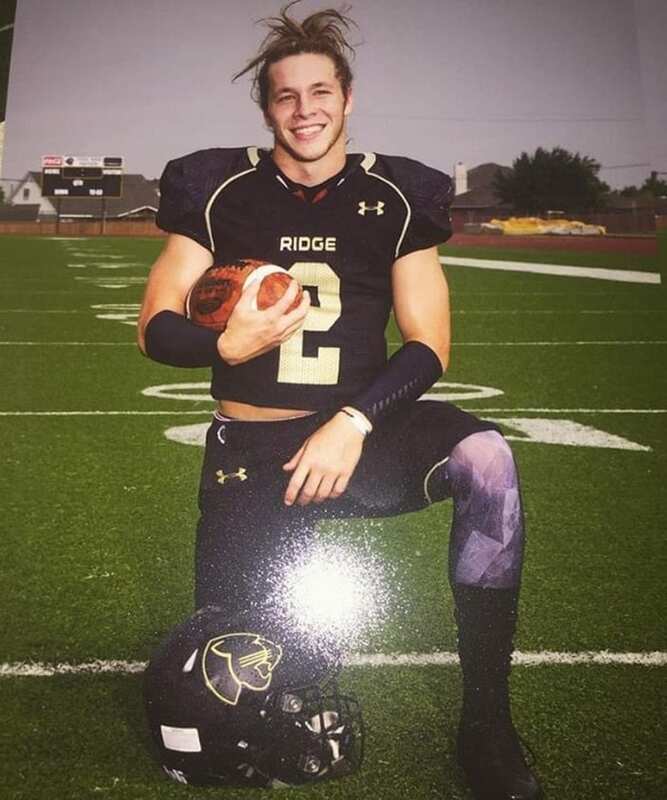 By his senior year, Akin was leading Fossil Ridge at the quarterback position. A dual-threat player, Akin was also one of the school’s undisputed leaders and most popular students. He had a bubbly personality and an infectious smile. This was no ordinary game for Fossil Ridge. 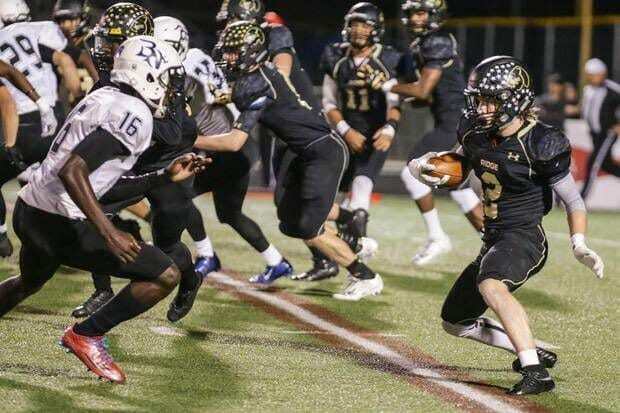 It was Homecoming Night — one of the biggest nights of the year — and all the lights were shining on the star quarterback. 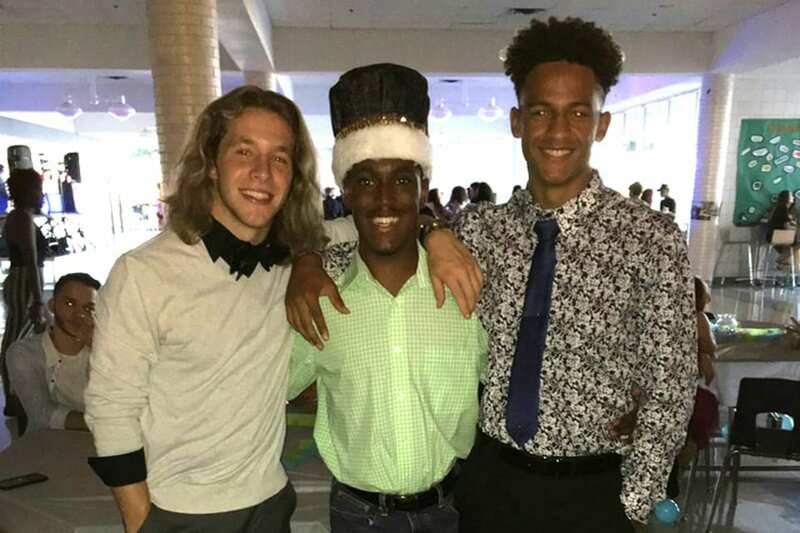 He was in line to win the prestigious title of Homecoming King and give his team a hard-fought victory. Akin was ready to be elevated into newfound stardom few high school students will ever know or understand. Meanwhile, his best friend K.L. 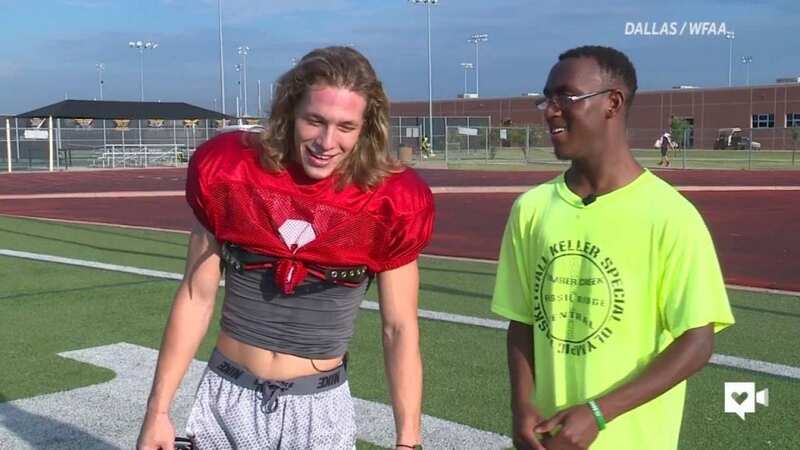 Norwood, the football team’s manager, looked on from the sidelines with his typical big smile, completely unaware that his life was about to change forever. K.L. — short for Kemper Louis — wasn’t even supposed to make it to high school. He wasn’t supposed to make it much past a complicated birth. When K.L. was born three-months prematurely, he weighed a mere 1-pound 13-ounces. Barely surviving his harrowing entry into the world, doctors gave his parents a grim prognosis. They said K.L. most likely would not be able to walk, talk, see, or hear. 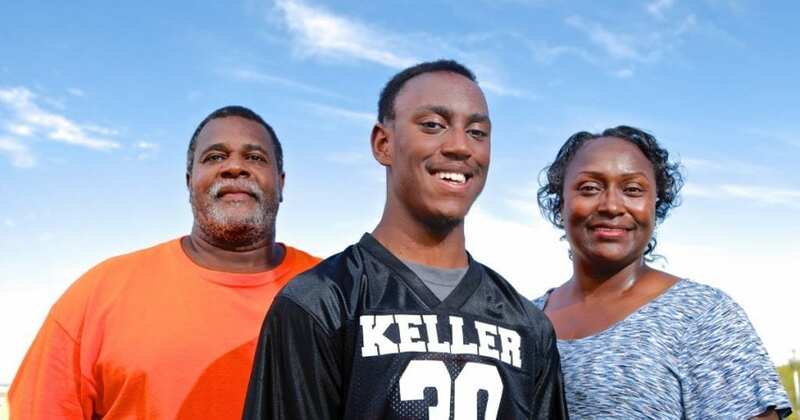 Doctors even gave his parents the option to take him off life support. They didn’t, but what they did do was give him an opportunity. The opportunity to live a full life, one that K.L. hasn’t taken for granted. Due to the complications of his premature birth, K.L. has cerebral palsy, a disability that largely affects one’s physical development. People with CP, as it’s commonly known, often lack basic coordination, can’t walk fluidly, and face a number of other developmental challenges such as speech impediments. And for K.L., CP meant he wouldn’t be able to play sports with the rest of his friends and classmates. But what CP couldn’t do was keep K.L. off the football field. Despite not being able to play organized high school sports, K.L. had a burning passion to contribute to his school. The place K.L. 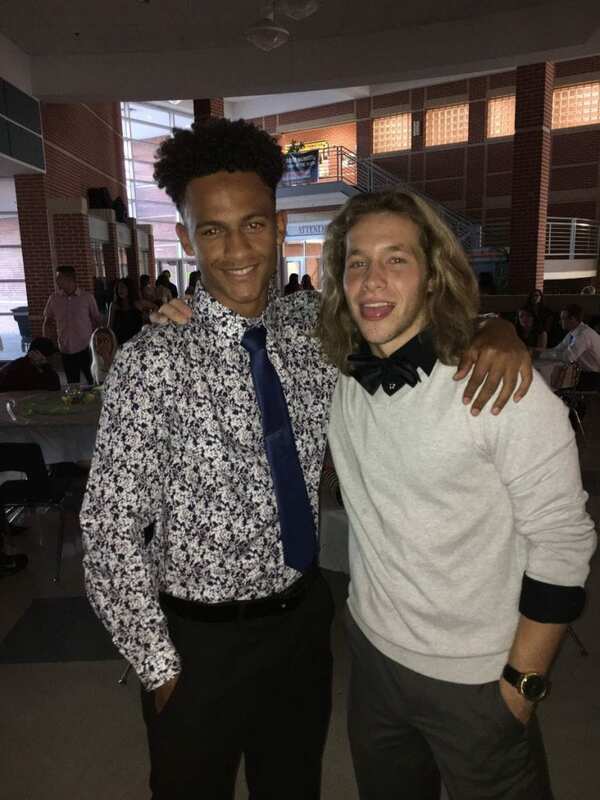 felt he could help the most was with the football team, the sport he loves the most. 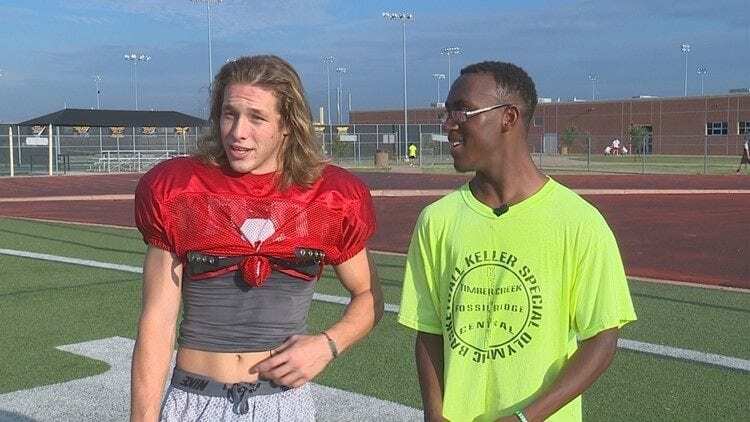 So as a senior, he decided he would be one Fossil Ridge’s student equipment managers. Every day before class, before the football team even arrived to the field, K.L. would be there filling water bottles, preparing the team’s uniforms, and ensuring everything was in order for the players. For his contributions to the school and his gregarious personality, K.L. was also nominated for Homecoming King. 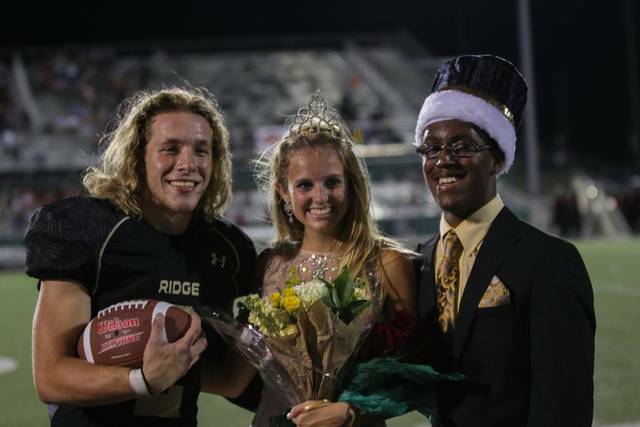 Besides the senior prom or a state championship game, there isn’t a bigger night for Fossil Ridge than homecoming. The event is marked by festivities, ceremonies, and a football game. Traditionally, there are five students, referred to as the royalty court, nominated for homecoming king. 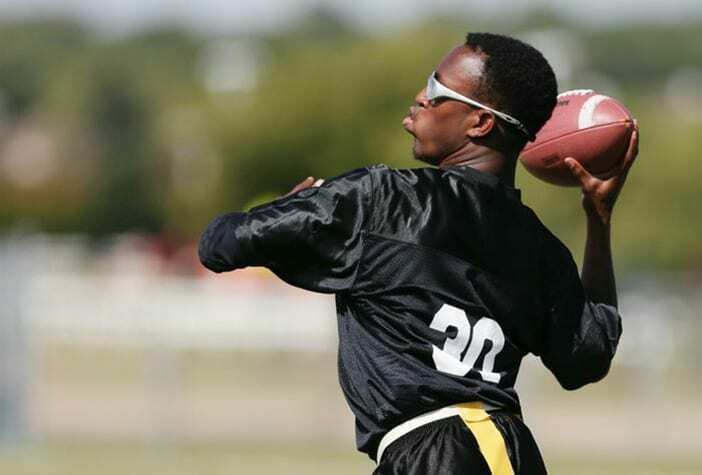 Each of the five participants makes a video explaining why they are deserving of the coveted title, and Akin, as the star quarterback, had a lot of potential to toot his own horn. To his credit, he didn’t, in fact, he did the opposite. Max Throws Support To K.L. Instead, Max made a video encouraging his classmates to vote for the student that “positively uplifts this school the most.” And if it was up to Max, that classmate would be K.L. “K.L. is honestly the most positive guy I’ve ever met in my life,” Max told ‘The Today Show’. Max received the crown and proceeded to take some pictures with the Homecoming Queen, but he knew something wasn’t right. He received the crown, but he also knew it might not be the perfect fit. He already had a special piece of headgear, and that was his football helmet. 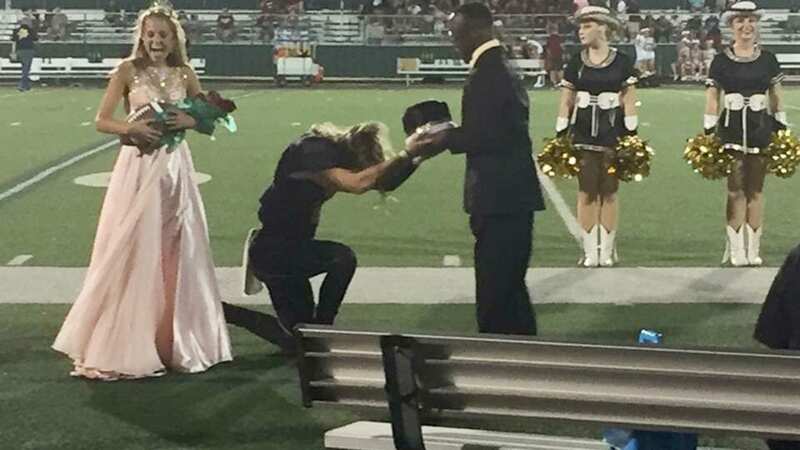 Without any warning or extra fanfare, after posing for photos with the Homecoming Queen, Akin turned to K.L., who was standing on the sideline nearby. 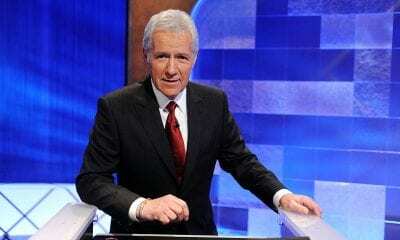 Akin motioned Norwood over and when K.L. approached, Akin suddenly dropped to one knee and handed K.L. the crown, bestowing the honor to the man Akin always felt deserved it most. The crowd, realizing the moment, erupted in cheers and the Homecoming Queen was overcome with her own emotions. It was the most perfectly executed play of the entire evening. With one of the school’s most beloved members receiving the honor of a lifetime, the crowd erupted as K.L. placed the crown on his head and chants of “K.L. !” echoed through the Texas night. When Max did come up crown-less from his knee, he gave K.L. a hug and told him he loved him. At that point the quarterback successfully led the biggest trick play in his career and let K.L. embrace the spotlight he never thought he’d have. But soon word got out on a national level about a star quarterback doing a selfless gesture for a friend. 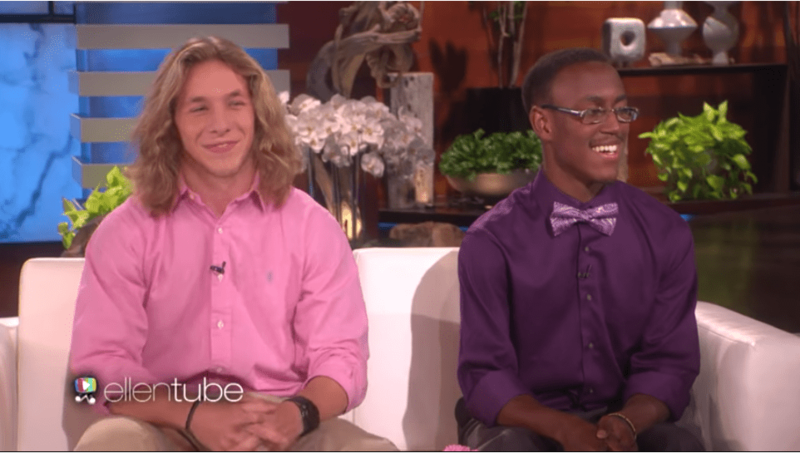 That’s when Ellen Degeneres picked up to the phone and reached out to the two Texas high schoolers. The Ellen Degeneres Show is among the most popular daytime talk shows on television. The host, comedienne and actress Ellen Degeneres, mixes the variety of her show with celebrity interviews, fun skits and pranks and stories of regular, everyday people who do extraordinary and selfless things to help others and make lives better. The latter segments are some of the most popular and heartwarming of her show, celebrating the good that people do, usually without fanfare, to make the world a better place, and there wasn’t a more fitting pair than Max and K.L. to make an appearance. Often, Ellen rewards these unsuspecting guests with lavish gifts, from money to cars to charitable donations. When producers for the Ellen Show were made aware of Akin’s touching gesture with K.L., it was only natural that she would want to share the act of kindness, selflessness and friendship with the world. 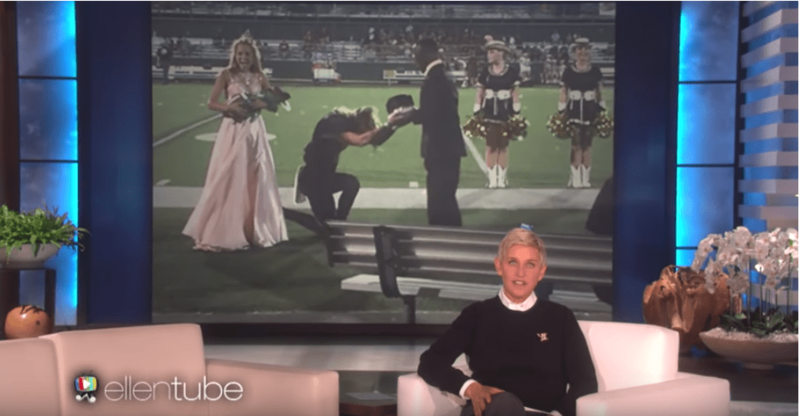 In late September, 2016, just three weeks after the homecoming ceremony, Ellen welcomed the two Kings to the her set for a celebration of their inspiring moment. 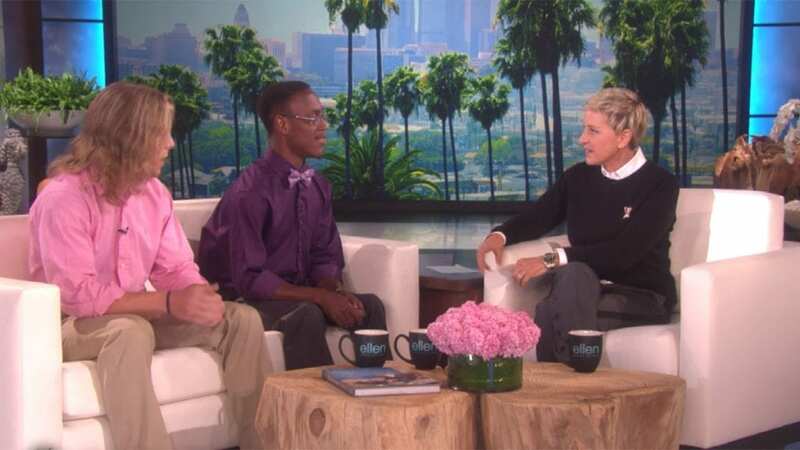 After Ellen told their backstory to the audience, Ellen invited the two on stage. Ellen thought it profound that Akin made the gesture for a friend with CP, but Akin said the disability had little to do with his decision. “I don’t see K.L. as a disabled person, I see him as a great human being. As a homecoming king you should really be able to make people happy and give good vibes all around the room, and K.L. never fails to do that,” Max said. And in traditional quarterback fashion, Max wanted to impart a more important message to the tuned-in national audience. Now he had the platform to do so, and he used it wisely. “I think me and K.L. really want to get across the fact that, as corny as it may sound, you’ve got to treat everyone the way you want to be treated. 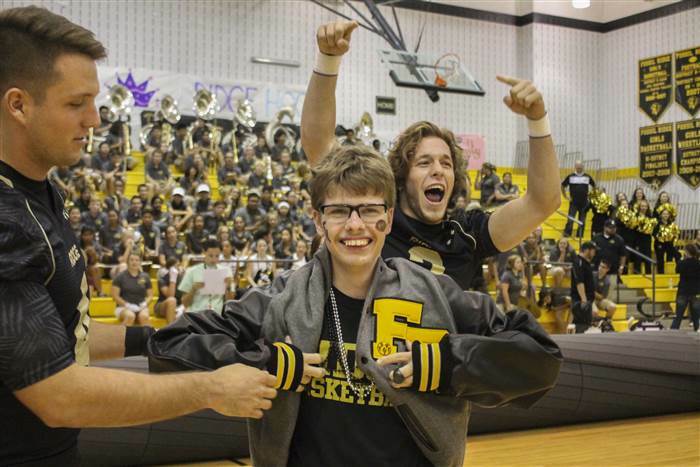 “If you ever have the chance to make somebody’s day or make somebody happy, you should take that chance.” And with that, like on the night of the homecoming ceremony, the crowd erupted in cheers. As their segment wrapped up, Max and K.L. were presented with the gift of a lifetime. 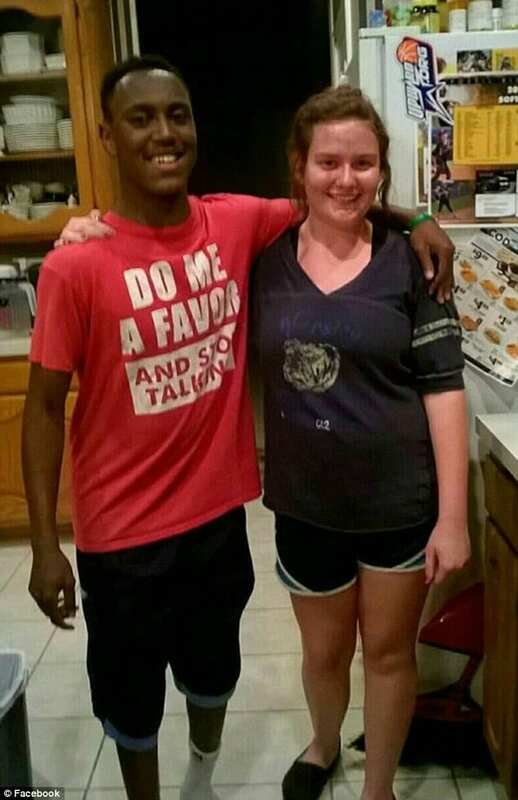 After declaring that they would both be attending college in the fall, Ellen announced that they were each receiving a check for $10,000, which would be used towards their education. 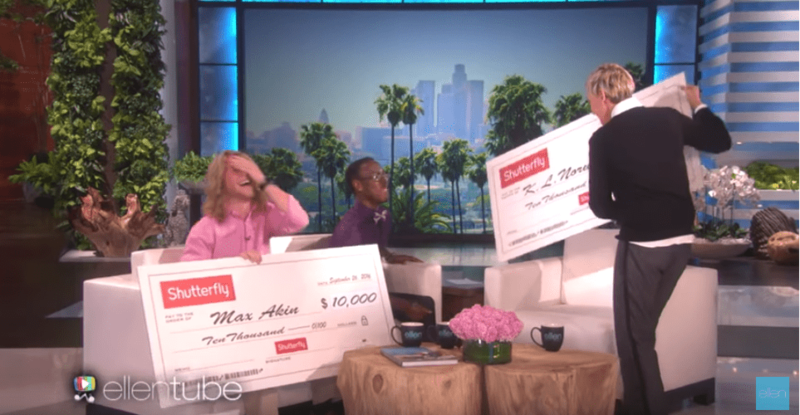 In trademark Ellen fashion, a production assistant ran on stage with two over-sized checks for $10,000 in each of Max and K.L.’s names. “We need more people like you in the world,” Ellen told the duo. 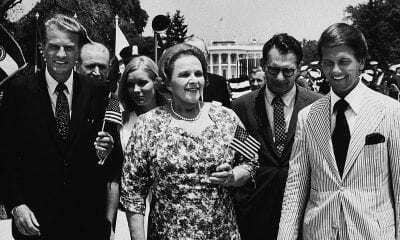 Wherever the two end up, their stories will forever be linked, and their message of respect and empathy will never be forgotten.